When the highway ends for Alaska's ice road truckers, the adventure is just beginning for the hearty souls who haul vehicles and freight across the North Slope on a network of frozen trails blazed across the desolate Arctic Ocean and tundra. The travelers include Barrow resident Arnie Arey, who a couple of years ago parlayed a hefty dividend from his regional Native corporation into a small off-road shipping company that tows cargo across snow and ice more than 300 miles from the state's already limited road system. When winter is cold enough, Arey, who owns Arnie's Northern Outfit and Cargo, fires up a heavy-duty Dodge truck outfitted with tank-like treads and hooks up the 22-foot-long custom-made sled he uses for dragging heavy loads across the roadless region. The cold season hasn't gripped the North long enough yet for him to work. Arey said customers save thousands of dollars if they use his business instead of an oceangoing barge or Hercules cargo aircraft operated by large transportation companies. "My word is 100 percent, and there's zero wear-and-tear or damage," said Arey. Barrow residents say the trips have become more common in recent years. Officials at the state and federal governments, two of the large landowners in the region, have no tally of the number of excursions, which begin in earnest starting in December. But in one sign of demand, James Qulliuq Pebley has launched Barrow's second offroad shipping business, Arctic Transportation and Logistics. "It was in Barrow in less than a week," Sage said. But it's not just companies making the cross-country treks along the snow roads and ice trails. Plenty of recreational road-trippers do it too, traveling to Prudhoe Bay from North Slope villages in trucks with standard road tires, then hopping on the gravel Dalton Highway made famous in the reality show "Ice Road Truckers." From there, it's 850 miles to Anchorage along the state road system. From Barrow, the adventurers can cross frozen bays and inlets along the sea ice route or head inland on snow roads packed down by rollagons, giant rigs with rollerpin wheels that pave the way for fuel deliveries to Barrow and other North Slope towns. "It's pretty sketchy" for trucks without special gear, said Stacey Fritz of the Bureau of Land Management, which manages the Indiana-sized National Petroleum Reserve-Alaska. "These snow roads are designed for vehicles with low-pressure tires, not standard four-wheel-drive trucks. The risk is if you slide off the road and lose your truck, how do you get it back?" Abandoned cars occasionally dot the tundra, said Melissa Head, a state official who permits off-road travel in the region. But oil field workers and rescuers from the North Slope Borough, as well as fellow travelers, help pull people out of trouble when possible. "Once the tundra is open for off-road travel, you can drive whatever you want as long as you don't tear up the vegetation or get stuck, which generally means you should have low-pressure tires for traveling across soft, rugged terrain," she said. The recreational trips through the "no-man's land" often happen in convoys, with friends digging each other out if a car spins into deep snow, said Lars Nelson, general manager of lands for the Native village corporation in Barrow. They'll take satellite phones, shovels, extra fuel, Arctic camping gear and other safety equipment. They'll buy items in the big city they can't get cheaply in Barrow and often stock up on groceries, too. "It's kind of a cowboy way to get your new car from the city to Barrow," Nelson said. "But it can save thousands of dollars, and it's the convenience of buying something and driving it to Barrow in a matter of days." One regular traveler is Barrow's Eli Kagak, who said he's made the journey several times over the last two decades. Sometimes he'll fly to Anchorage, buy vehicles for others and drive them up -- the smallest being a Honda Pilot SUV, he said. 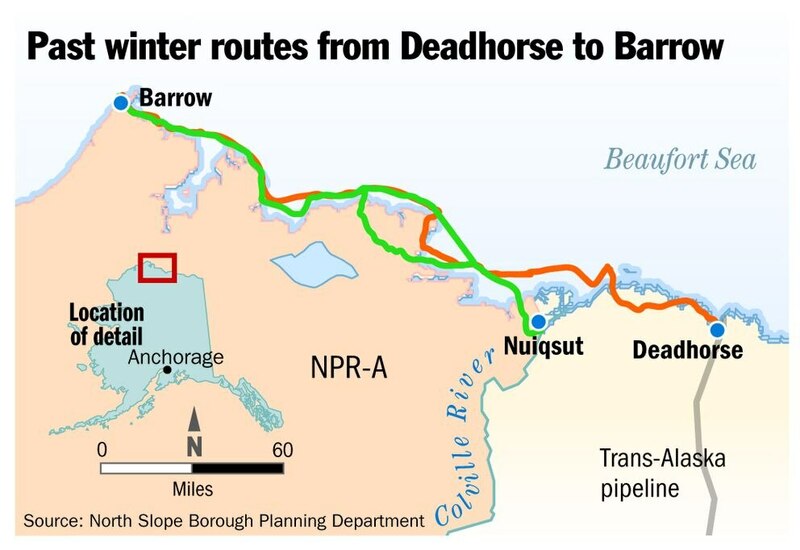 "You take everything you need because there's no gas stations between Barrow and Prudhoe Bay," he said. Kagak has endured "pure whiteouts" the entire way and temperatures so low -- with wind chills 80 degrees below zero -- two fuel hoses shattered as he tried to replenish the tanks. Once, he and other drivers found a man almost frozen to death in his car after running out of gas. The North Slope Borough Search and Rescue Department rescued him by helicopter. Kagak was also rescued by the borough after one vicious snowstorm, when he ended up in drifts so thick the motor wouldn't start, forcing him to activate his personal locator beacon. "When the snow is five or six feet deep, get ready to dig," Kagak said. Kagak said he charges only for his travel costs and loves passing through a wild expanse dotted with wolves, caribou and foxes. "The best thing I receive out of it is God's country, and I enjoy every minute of that trip," he said. Arey, of Arnie's Northern Outfit and Cargo, said he often travels on sea ice along the coast. "I see polar bears all the time," he said. "Sometimes off in the distance." He said he checks with the North Slope Borough and others to let them know where he'll be, part of an effort to improve safety for himself and others. "I help a lot of stuck people," Arey said. An uncle founded the cargo-hauling business that Arey bought a couple of years ago. He used five $10,000 dividends from the Arctic Slope Regional Corp. to buy it and acquire extra gear, such as the rubber tracks that bolt to the wheel studs like tires. "I got four kids, so that was $50,000," he said of the dividends he spent, including his own. "I made it all back in two months, there were so many people hiring me." He works nonstop once the sea ice freezes, often traveling alone but sometimes with friends who know the outdoors. "So many people I lost count," he said, referring to his clients last season. "I lived in the tundra the whole winter." And business is growing. "I get a lot more calls for a lot more stuff, and people want me to expand more," he said. He drives newly purchased vehicles up the road system and then puts them on the sled, hauling them to Barrow or other North Slope villages. He once hauled two vehicles to elders in Wainwright, at least another 90 miles west of Barrow. "Those people have never driven in, like, 20 years. They were super happy," he said. Once, around New Year's, he hit soft sea ice along the coast and gunned his truck onto the beach. "The ice broke behind me," he said. He said he's getting ready to renew his permits and should be hauling cargo next month. He's already got some work lined up, including with an oil field service company that wants him to haul freight to a remote site. His business pays well enough that he takes his summers off, leaving time for hunting and camping with his kids. "I love it. I wouldn't want to do anything else," he said.